Pool company - Can you please let me know who made the pool and what colour it is? Timber Wall - Hi , Can you please tell me if the timber has faded at all?? Is it a lot of maintenance?? love the bench. - I really like the floating look that you've given to the bench. Natural and man-made balance. 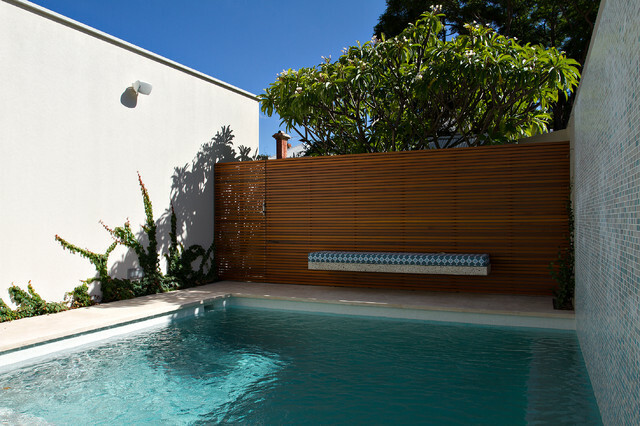 The golden brown of this timber battened wall adds a warm contrast to the plastered and tiled walls on either side of this Perth garden. Running the battens horizontally gives the impression the space is wider than it is, and the cantilevered seat turns the wall into a beautiful focal point. Rebecca Gross added this to Floating Furniture: Can You Handle the Suspense? And finally, one very simple poolside bench. This backyard is all about mixing textures and patterns – tiled walls, timber fence, printed upholstery and a marbled bench – and it works. This bench is ideal for sitting or lying down, catching the sun or enjoying the shade. And by floating it up the timber wall it has a lightness and airiness that harmonises with its surroundings. 2. Fibreglass or concrete? Fundamentally, there are two types of pools on the market: prefabricated, ‘off the shelf’ fibreglass products and in situ built concrete options. Both have varied pros and cons. Fibreglass options are often cheaper, quicker to install and the spas seats are more comfortable, but as they are ‘off the shelf’, often the pool fencing/compliance requirements are ignored, which is highly illegal and comes with potentially disastrous ramifications. could we have a chaise on top of the waterfall that's attached to the fence?? ?